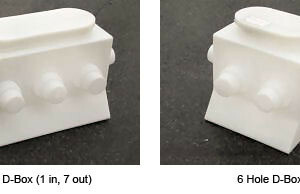 Select nozzle(s) to be used. Note: Inlet is 3″ higher than outlets. Cut off end of cone at marker line. Use a fine sawblade. Squeeze pipe stub through cone from inside. End of cone will expand over pipe to make friction-fir joint. Install Tee-Y baffle on inlet pipe if required. Lay D-Box completely level in bed of sand or clean soil. Glue bell ends of drainage pipe to pipe stubs. If required by Health Department, connect 2′-3′ of unperforated pipe to each outlet. Check level prior to backfilling. Use ‘speed levelers’ if necessary. Replace snap-on cover. Option: cover with board before backfilling. For airtight cover, affix 1/16″ thick adhesive closed cell foam tape around underside of cover. No ‘O’ rings required with this model.